A vitrectomy is an operation in which the vitreous jelly which fills the posterior chamber of the eye is removed. This is usually done to gain access to the retina and treat diseases which threaten the vision. The commonest reason to perform a vitrectomy is to repair a retinal detachment. Removing the vitreous also allows access to the macula, permitting surgery for macular holes and epiretinal membranes. Less common indications for vitrectomy surgery are the removal of troublesome vitreous opacities and floaters, the removal of dislocated cataract fragments or dislocated lens implants, and the treatment of complications of diabetic eye disease or infections inside the eye. The technology used for vitrectomy surgery has improved dramatically over the last 30 years making it now possible to safely perform surgery through minimally-invasive incisions under 0.5mm, without the need for suturing, using local anaesthesia and taking 30 to 45 minutes on average. Improvements in technology have also made these operations much safer and much more widely applicable. Minimal manipulation of the eye is required, and recovery is fast. As the vitreous jelly is removed, a continuous fluid infusion maintains the shape and pressure of the eye, while the surgeon works on the part of the retina requiring treatment. Sometimes patients need to keep a special position after surgery which may involve laying down with the head resting on one or other side, or sit face down with the eye pointing towards the ground. This is needed to place surgical gases or liquids against specific areas of the retina, or to displace fluids inside the eye in a particular direction. You will be explained how to do this while minimising any discomfort it may cause. I do not routinely advise face down posturing to macular hole patients. 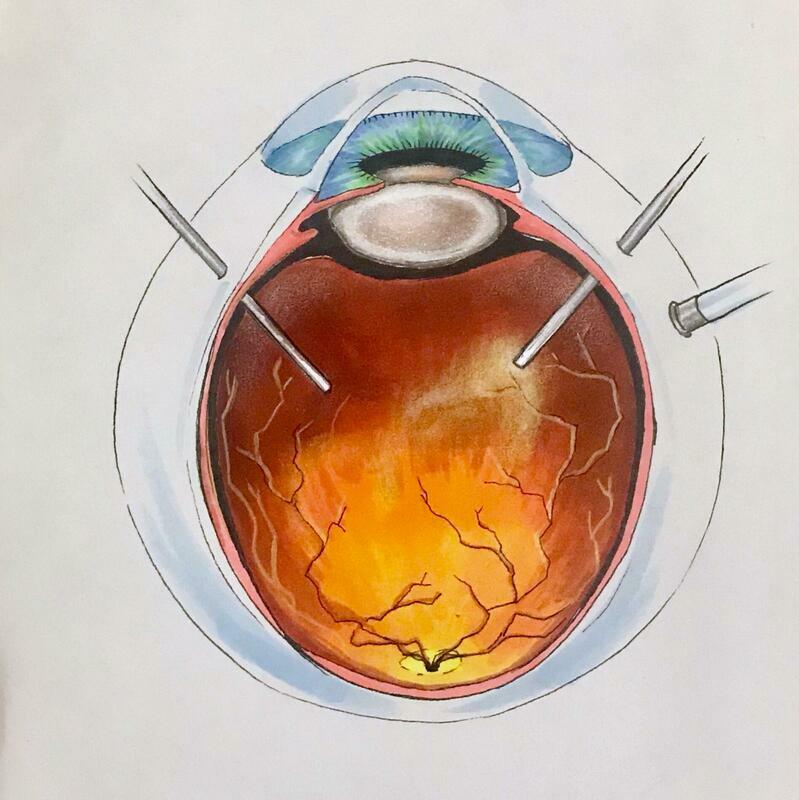 As part of vitrectomy surgery and treatment, often the vitreous cavity is filled with gas or oil to hold the retina in place as the treatment applied to it takes effect. Surgical gases dissipate by themselves over a number of weeks. These gases do not let the light focus well inside the eye causing a temporary blurring of the vision. As gas bubbles inside the eye experience changes in volume with significant changes of altitude, it is strictly contraidicated to undertake any air travel or significant changes of ground altitude. Additionally, if a general anaesthetic becomes needed, the anaesthetist needs to be made aware of the presence of gas in the eye. A safety bracelet is placed after every operation.